The event in question is named nibun-no-ichi seijinshiki, meaning “halfway to coming of age”. Celebrated when a child is 10 years old, it’s a marker of the midway point between birth and adulthood. Ten years of childhood gone, ten more years before becoming an adult; it’s a time when children give thanks to their parents, and think about their hopes and dreams for the future. More and more schools and local organisations around Japan are hosting nibun-no-ichi seijin ceremonies. A 2008 survey in Aichi Prefecture showed that half of the prefecture’s towns and villages were holding a ceremony for local 10-year-olds. In Tokyo now, 1,331 elementary schools – more than half those in the metropolis – celebrate the festival. Residents of Nishinomiya, Hyogo Prefecture, claim it as the birthplace of nibun-no-ichi seijin, saying the event was invented by a Mr. Kato around 30 years ago. It’s thought that the event’s recent popularity stems from its inclusion in a 2002 elementary school textbook. 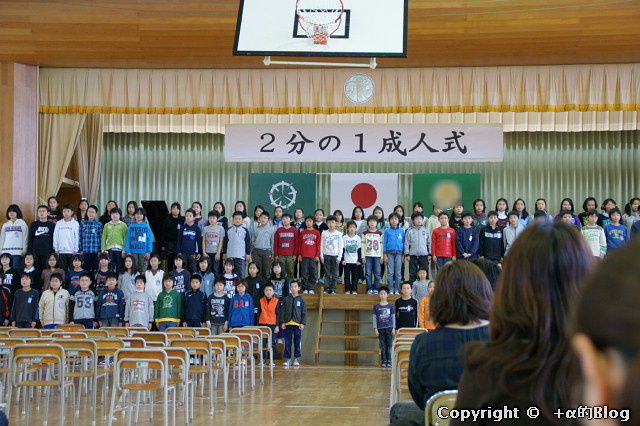 Because the event was being studied in school anyway, teachers started to hold miniature ceremonies in Japanese language classes, and this gradually migrated into whole-grade events held in the gymnasium, with parents attending as guests and participants. The ceremony can include songs or poetry performances from 4th graders, the students who have turned 10 years old. Students also write letters of thanks to their parents, who may present letters or gifts in return. ▼ A 4th grade student receives a “halfway to adulthood” certificate from a teacher. At one elementary school, students collected together their kanji tests from the day of the ceremony, a few photos from their childhood so far, and a letter each student had written to their future adult self. The items were put into a time capsule to be buried in the school grounds and opened on Coming of Age Day in ten years’ time. ▼At this elementary school, students write their dreams for the future on a message board to be displayed at the ceremony. While the halfway ceremony is thriving, full-scale Coming of Age ceremonies for 20-year-olds have been on the decline in recent years. Twenty is the age of majority in Japan; it marks the age at which young adults can legally do all kinds of exciting things like drink, smoke, gamble and vote. For many young women, the Coming of Age ceremony will be the first time they wear a full extravagant kimono. Participation has been dropping off in recent years though, in part because increasing numbers of Japanese 20-year-olds don’t consider themselves to be adults yet. ▼ Girls visiting a shrine on Coming of Age Day. The halfway ceremony for 10-year-olds, however, could mean big business. Kids don’t tend to wear special clothes at the school events, but like the shichi-go-san festival for girls who are 3 or 7 years old, or boys who are 5, photography studios have spotted a gap in the market for commemorative packages. ▼ This photo studio offers kimono, western-style dress, or more casual group photos to celebrate a child’s tenth birthday. It remains to be seen whether Coming of Age Day will make a comeback – in 2012 the number of attendees dropped below 50 percent for the first time, suggesting that the event for 10-year-olds is currently better attended than the main event. For the moment, though, it seems like Japan’s children are taking the opportunity to appreciate their parents and look to the future.